When it comes to hotel elite status, there’s a lot to consider among the various chains. Most offer standard benefits to their elite members such as free internet, points-earning bonuses and even complimentary breakfast and welcome gifts. But Starwood Preferred Guest has a few benefits that set it apart and make it my favorite program for top-tier hotel elite status, including a few that were introduced last year when SPG updated its elite benefits – and the fact that there are over 1,000 properties (with more coming online every month) in brands I enjoy like St. Regis, Westin, the W and Sheraton where I can enjoy those benefits puts Starwood Preferred Guest firmly in first place in my hotel elite status quest. That’s part of the reason I keep both the personal and business versions of the Starwood Preferred Guest Amex in my wallet since each of them gets me 2 stays or 5 nights closer to requalifying for elite status each year, and if you’ve been considering them, from now until September 3, 2013, the sign-up bonus has been raised to 30,000 points when you spend $5,000 within 6 months of account opening – which is 20% higher than the usual bonus on this card. As a quick refresher Starwood offers three tiers of membership – Preferred (regular), Gold and Platinum, though Platinum is further subdivided into members who complete the 25 stays or 50 nights, 50 Night members, 75 Night members and 100+ Night members. Here’s what you get at each level. Starwood Preferred Guest program is broken down into basic, gold and platinum (which is then subdivided). Earn 2 Starpoints for every $1 you spend at Starwood hotels. Just your standard earning level without too many bells or whistles. As well as standard benefits like room upgrades and 4pm late check-out subject to availability. Platinum members get complimentary continental breakfast. 1. Continental breakfast for the entire length of stay, including one in-room guest. This will be eligible at all brands and all hotels. Must be in the on-site restaurant (not room service). Hotels have flexibility to determine what this means, but generally continental breakfast is juice/coffee/breads/cereals – they will be allowed to offer a full breakfast for an up-charge beyond $15. If property has a club that serves food, you still have access as a Platinum guest, so you could also choose the 500 Starpoints. 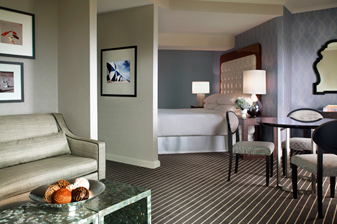 Suite upgrades such as at the Sherton Delfina in Santa Monica are available to Platinum members. Platinum members who surpass the 50-night mark earn 10 Suite night awards. You can use them to confirm certain suites and premium rooms beginning 5 nights prior to arrival, subject to availability. For more information on these awards and how to maximize them, check out this post. When you hit this threshold, you get still more perks, including a lucrative earning bonus bump to 4 Starpoints per dollar. 1. 4 Starpoints per dollar spent- 2 base points that all SPG members get, plus 2 points for being a “75 nighter” (regular Platinum members get one extra points per dollar). As always, you can bank an extra 2 Starpoints per dollar if you put your stay on the Starwood American Express card. 2. YOUR 24– The ability to check in any time you want and check out 24 hours later. You’ll receive a Starwood Ambassador. These Ambassadors are the highest level of Starwood phone reps and will act as your personal concierge to make sure your reservations are exactly what you want and will even help you plan activities and resolve any customer service issues. Like many other hotel co-branded credit cards, the Starwood Preferred Guest personal and business American Express cards both offer a little boost when it comes to achieving elite status. Though some competing cards offer status outright, like the Hyatt Visa (Platinum status), and the Citi Hilton HHonors Reserve card (Gold status), both SPG cards give you 2 stays or 5 nights worth of credit towards elite status qualification. By carrying both of these cards myself, I get 4 stays’ or 10 nights’ credit towards elite status requalification right off the bat every year. If I were just going for Gold status, I’d also have the option of spending $30,000 in a calendar year on either card, and that would earn it for me automatically. I also carry the Mercedes-Benz Platinum card from Amex, which, like the personal Platinum card and the Business Platinum Card from American Express both confer automatic SPG Gold status on cardholders. But I’m a 100-Night Platinum, and I enjoy the benefit of having an Ambassador as well as the 75-Night perks like YOUR24 (when it works) that allow me to get to the hotel and right into my room when I occasionally show up at odd times thanks to global flight connections (like arriving in Europe or Asia first thing in the morning), so having the elite stay/night credit from both cards is a real boost to my bottom line. 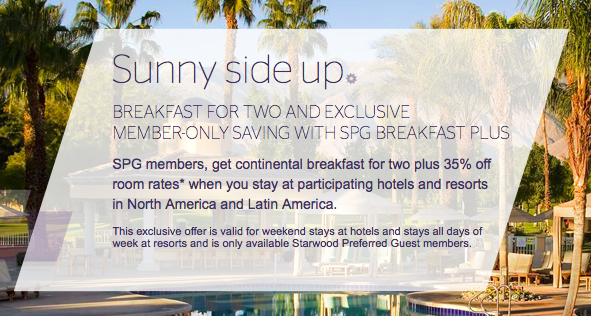 Starwood’s member perks mean that I will be keeping the SPG credit card in my wallet for the foreseeable future. That’s the primary reason why, though other hotel credit cards may come and go, these two will be sticking around my wallet permanently. Not only that, but when I use either to pay for my Starwood stays, I earn 2 more Starpoints per dollar on top of my elite bonus for a total of 6 Starpoints per dollar. 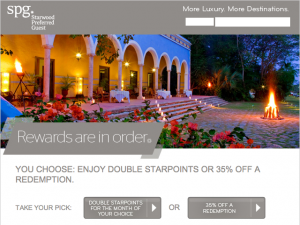 I value Starpoints at about 2.5 cents each, so for me, that’s like getting 15 percent back on my hotel spending. The one drawback is that the Starwood Amex cards both charge a 2.7% foreign transaction fee, so I avoid using them abroad, even on Starwood stays. On the other hand, the business version has a variety of key perks since it is part of American Express’s OPEN program, which is a series of benefits and savings unique to Amex’s line of business credit cards that can really add up to huge savings. Recently there was a major covert overhaul of the program where you can earn up to either a 10% discount or 4 bonus Membership Rewards points per dollar when shopping at various merchants. This card isn’t eligible for Membership Rewards points, so I get the discounts including 5% off at Hertz, 5% off at Hyatt and up to 10% off at Office Max. Because of those discounts, it can even make sense to charge my stays at Starwood’s competitors, like Hyatt, to this card! This is probably my favorite top-tier elite perk from Starwood. You can use these suite night awards to confirm certain suites and premium rooms beginning 5 nights prior to arrival, subject to availability. This is intended to be an upgrade to a suite, but some hotels won’t be able to fulfill it due to capacity, so there will be other options to choose from including oceanfront rooms at some resorts. In some cases, you can even select the exact room you want to be on the list for and will be able to see all options on SPG.com -> My Stays. Using these wisely means potentially getting 10 nights a year upgraded to a suite several categories above the room you book, which can be worth thousands of dollars – and you can use these on award stays as well as paid stays, making them super versatile. This status sticks with you for life. Among the new enhancements to the program that SPG introduced last year was lifetime status, which is achieved at the following thresholds. Though other chains do offer lifetime elite status, Starwood gets extra points (so to speak) in my book thanks to the simple formula for achieving it and the reasonable qualification thresholds. I actually think Starwood could be a little more generous with this benefit, especially compared to other chains since you have to hit 50 nights (not just 25 stays) to earn it, and it’s only a continental breakfast. For instance Hilton Gold status (20 stays/40 nights) offers both high-speed internet and a choice of continental breakfast or 1,000 points while Hyatt Diamond (25 stays or 50 nights) offers a full-breakfast, often available via room service, for all registered guests in addition to a 1,000-point amenity. Still, it’s nice to know that breakfast – even if it’s basic – is taken care of on a stay, especially in destinations like Europe where it can get quite expensive. Although room availability can be spotty with this benefit, I still like having the option and have put it to good use on my travels to far-flung places when my plane gets in super early or super late and I want to be able to get to my room immediately. YOUR 24 is the ability to check in any time you want and check out 24 hours later (or at the same time on your check-out date). For example, if your flight arrives at 4:00 am, you can confirm that arrival time and check out at 4:00 am on your departure day, which could be a good benefit if you have a late-night flight. You just need to confirm it within 48 hours. Plus, if you check in anytime 9am and after, you still get 4pm late checkout. If you check in before 9am, your 4pm late check-out will not be guaranteed. It definitely came in handy for my stay at Le Meridien Monaco last October. Reserved for the very top-tier of elites, a Starwood Ambassador is basically your one-stop helper with all things Starwood, who can help you with everything from reservations and booking issues to concierge questions. I am in touch with mine all the time and she is usually on top of my stay activity, quick to offer suggestions from on-the-ground staff where I am heading and the person I turn to first when anything goes awry with my SPG stays. Granted, I wish she were a little more empowered to make things right when things do go wrong – as they inevitably do with travel – but she is usually good about staying informed of my situation and helping me resolve any issues. 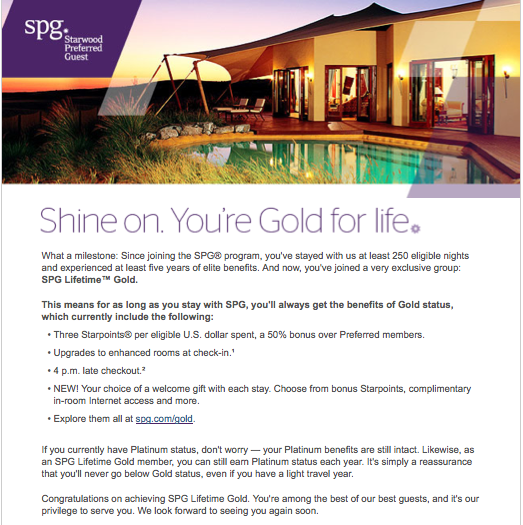 One of the other unique features of SPG is that Starwood offers elites who requalify for their tier in 2013 a choice of elite gifts. Golds who requalify (10 stays/25 nights) get the choice of a 25% discount on one award stay or double points for a month, and Platinums (25 stays/50 nights) get the choice of a 35% discount on one award stay or double points for a month. I recently requalified for Platinum with 50 nights year-to-date thanks in part to starting the year with 10 elite nights thanks to my SPG Personal and Business Amex cards which give 2 stays/5 nights each towards elite status (as I mentioned above). These Elite Gifts aren’t mind-blowing, but they are a nice way for SPG to say thank you to its loyal customers and some of those discounts can really save you a ton of points. To get notification of your elite gift, make sure you’re opted in to Starwood’s promotional emails.